Many people put a lot of time into being successful. They may go to school, start a business, or even invest money with the ultimate goal of becoming independently wealthy. Unfortunately, many of these same people reach the end of their life missing out on the important things in their pursuit of success. 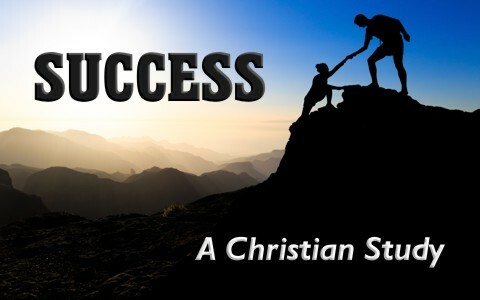 What does the Bible say about success? A short Christian study will provide the answers. For many people, success is the attainment of prosperity or popularity. For others, it may be accomplishment of a goal such as winning a gold medal at the Olympics. In either case, the person is willing to devote a lot of time and effort to making it happen. When success it elusive, some people will devote more time and effort to their goals. Others still will try and take shortcuts that may not always be legal. In the end, they see their success as the ultimate source of happiness. Unfortunately, by worldly standards many people become successful, but they do not experience the happiness they thought would come with it. As a former nurse and a pastor, I have seen many people on their deathbed during their last moments of life. Not once have I ever heard anyone say they wish they had spent more time at work. Or, they had worked harder to make more money. Or, they wished that they had more time to be successful. No, instead, what most people hope for is more time to spend with their loved ones or do the things that they should have done when they were in a better condition. In the end, they realize that success is not the things the world says it should be. Success, is having life itself and having it abundantly for an eternity (John 10:10). What does the Bible say about what we should be devoting our time toward? Sadly, many people do not realize what the Bible says about success until it is too late. While there is nothing wrong with working hard and enjoying the fruits of our labor, sometimes we forget that each of us as believers are called to a holy vocation (Ephesians 4:1-3; 1 Corinthians 7:20-23). For we have but a finite time upon this earth so we must be very careful in how we use our time (Ephesians 5:14-16). As humans, our bodies are sown in corruption and die, never to see the glory of God face to face (1 Corinthians 15:35-57). It is with an eternal mindset that we must always be about the work of the Lord until such time as he calls us home (1 Corinthians 15:58). Until that day, we have no other vocation than that of a soldier, warring against the forces of darkness that seek to shipwreck men’s souls (1 Timothy 1:18-20). Yet, there is no discharge in that war so we are not to entangle ourselves in the affairs of this life, but to endure the hardness of this life, working for the success that God sees as worthy (2 Timothy 2:1-14). How does the Bible measure success? A godly mentor of mine always said, “You will never see a U-Haul, behind a hearse.” We know that we cannot take anything with us. We must understand that we brought nothing into this world and we can take nothing out with us, not withstanding other believers to whom we have shared Christ (Job 1:21; James 5:15-16). While we work day in and day out to provide a good life, it can all be taken away in a moment. Therefore, we must work for the success that results in eternal things. Our lives are but a vapor of nothingness in comparison to eternity (James 4:13-15). For it is by our faith in Christ by which He grants us our rewards and success (1 John 5:4-5). By our faith in who He is and that He is a rewarder to those who diligently seek Him, whereby He is pleased (Hebrews 11:6). Therefore, our works that are done out of a love for Him and our neighbor is what gives us the success and inheritance that lasts (1 Corinthians 3:9-15). One that comes not from our labors, but the labors of Christ for us (Psalms 18:20; 1 Corinthians 9:16-18; Hebrews 10:35). This success and inheritance is kept by God until such time as He calls us home – a time that is so precious in His sight (Psalms 116:12-15; 1 Peter 1:3-5). Until then, our work is but that of a servant, calling upon the name of the Lord, paying our vows to Him, in holy praise of His name (Psalms 116:16-19). Many people put a lot of time into being successful. For many people, success is the attainment of prosperity or popularity. In the end, they realize that success is not the things the world says it should be. Success, is having life itself and having it abundantly for an eternity. We have but a finite time upon this earth so we must be very careful in how we use our time. It is with an eternal mindset that we must always be about the work of the Lord until such time as he calls us home. For it is by our faith in Christ by which He grants us our rewards and success. This success and inheritance is kept by God until such time as He calls us home – a time that is so precious in His sight. Until then, our work is but that of a servant. Very good article. Since I have turned back to God I am trying to be a lot let materialistic. I am selling a lot of things to clear out the excess and am now giving to the church regularly and to adopt-a-child charity overseas. It makes me feel so much better to give, but have never given enough outside my family. I am changing that. I also feel better with a lighter material load. Someday I will either give everything away, or donate it to charity, or both. I do think it’s okay to enjoy some things while you are here, as long as it doesn’t interfere with your relationship with Christ. Hello, this is a nice way tho, I think success should just be, finding a way to live happy, this is it, not fame, not popularity, just, happiness. Previous post: Why Did God Create Outer Space?